Monia Mazigh Book Lauch, originally uploaded by johnwmacdonald. 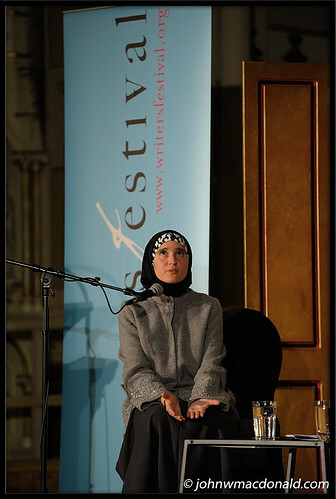 Monia Mazigh pauses in reflection while answering questions on stage at an Ottawa International Writers Festival event in her honour. On September 26, 2002, Maher Arar boarded an American Airlines plane bound for New York, returning early from vacation with his family because a work project needed his attention. He was a Canadian citizen, a telecommunications engineer and entrepreneur who had never been in trouble with the law. His nightmare began when he was pulled aside by Immigration officials at JFK airport, questioned, held without access to a lawyer, and ultimately deported to Syria on the suspicion that he had terrorist links. He would remain there, tortured and imprisoned for over one year. Meanwhile his wife, Monia, and their two children stayed on visiting family in Tunisia, unaware that their lives were about to be torn apart. This is a remarkable story of personal courage, and of an extraordinary woman who lets us into her life so that other Canadians can understand the denial of rights and the discarding of human rights her family suffered. Candid, poignant, and inspiring, this is the most important book of the season.